The kitchen's breakfast bar is often overused and under appreciated. In addition to being the home's favored meal spot, the kitchen island is used for entertaining friends, planning the summer vacation and enjoying family gatherings. 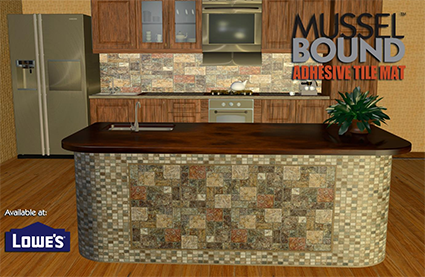 Bring new appreciation and style to the front and sides of your home's most popular fixture with MusselBound and beautiful tile in a multitude of colors, patterns and textures. It's quick and easy with MusselBound Adhesive Tile Mat! Match the tile on your kitchen backsplash or add your own creative flair with an exciting new accent to your island or breakfast bar. Tile over existing tile, wood and laminate or apply MusselBound to new underlayment. Complete the entire project in only a few hours or work leisurely at your own pace. We look forward to seeing photos of your DIY tiled kitchen island. Please send your DIY pictures and a review of MusselBound Adhesive Tile Mat to musselbound.com, Facebook, pinterest.com/MusselBound, Wayfair.com or lowes.com.